You don’t have to go back to school to improve your writing. 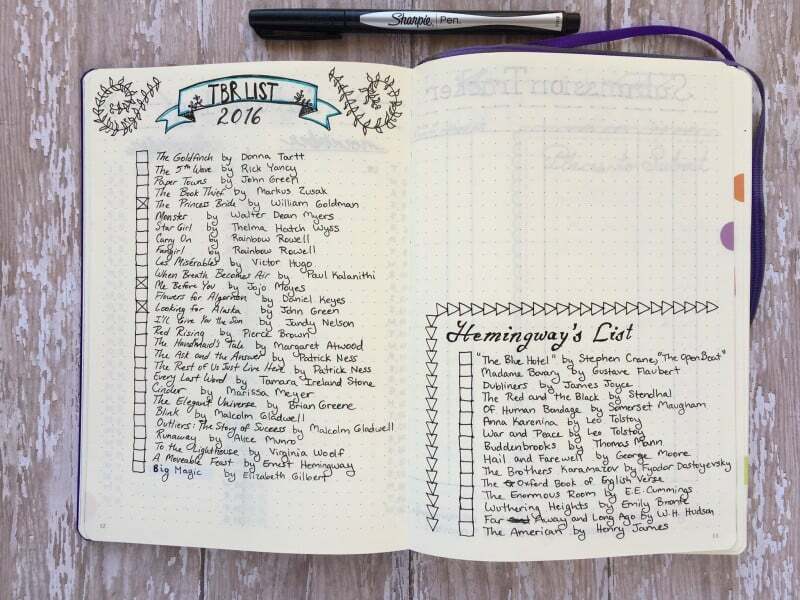 Add these pages to your bullet journal to supercharge your writing skills. Even after I completed my master’s degree in creative writing, I didn’t quite grasp the diverse ways people use writing to reach their goals. It wasn’t until I started Page Flutter that I noticed how many writers were disguised as other professionals: craft bloggers, graphic designers, food critics, fitness celebrities. Most of these people are not novelists or authors, but they are writers. 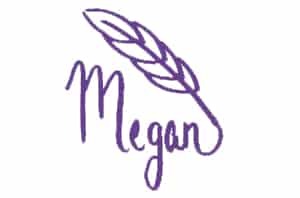 If you’ve been to my site before, you know that my journal plays a pivotal role in organizing my endeavors. What began as a simple way to organize my creative writing thoughts became a springboard to explore new expressive formats. 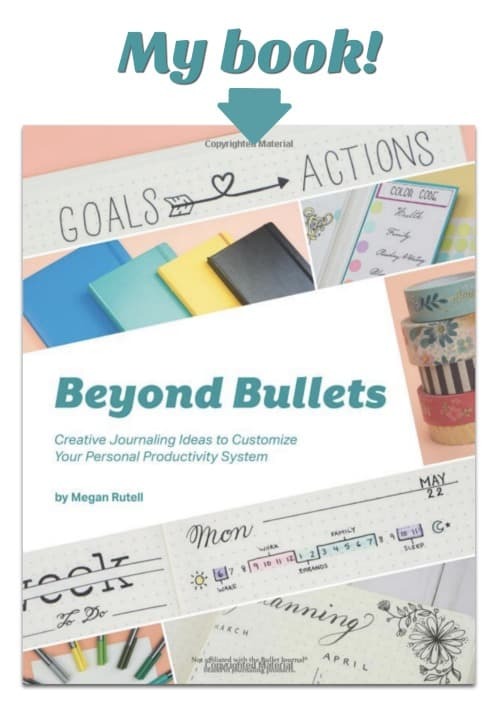 Maybe you haven’t taken the plunge into bullet journals—take a minute to read this post. Otherwise, grab a pen, and get your lists going! There are two reference books I use consistently, and they apply to all writing styles: The Elements of Style (4th Ed.) by William Strunk Jr. & E.B. 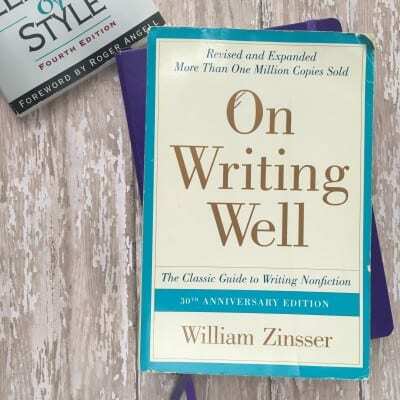 White and On Writing Well by William Zinsser. They’re not expensive, and you’ll turn to them often. On Writing Well focuses on big-picture writing skills: principles, word choice, drafting messages for your audience, editing for simplicity, etc. You can tell from the photo that I’ve put my copy through the wringer. It cuts right to the heart of what makes writing effective, without a lot of fluff or philosophy. 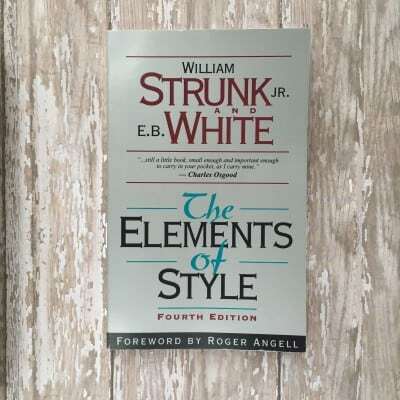 The Elements of Style is a style guide, so it is centered on the nitty gritty aspects of writing and includes a handy grammar terminology glossary in the back. Whereas some style guides have the heft of dictionaries, this thin little number is small enough to carry in your pocket…just in case of a writing EMERGENCY! You never know. Both titles are widely recognized in writing circles as essentials, and I’ve used them in every fiction and nonfiction course I’ve taken. Two extra copies even followed my husband home from work! 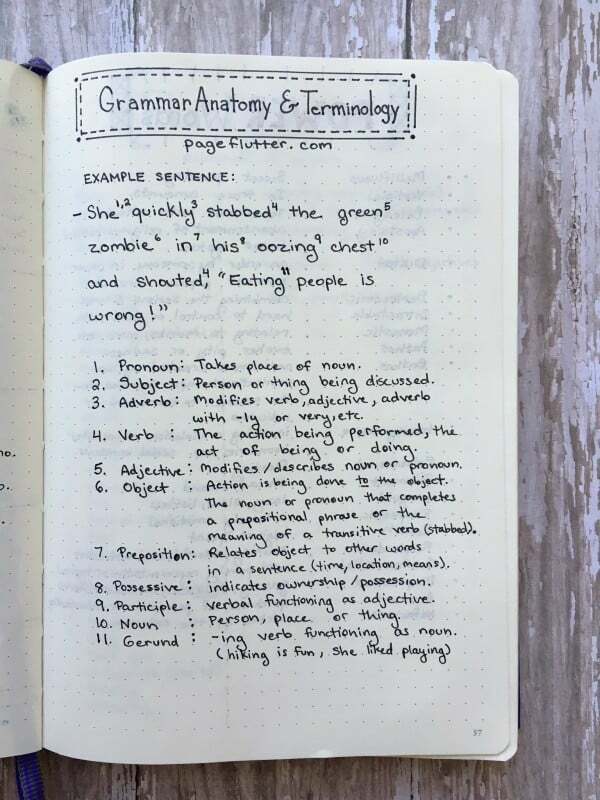 Both books cover common mistakes that weaken writing, and provide tips on structure, word usage, and mechanics. Now, let’s get some ink on the page! Related to your reading list, but you may have certain authors whose style of writing you consistently admire. Make note of what they do especially well (dialogue, research, suspense, etc.). Don’t be ashamed if you can’t remember the difference between a sentence subject and object, an action verb versus a gerund, or whether you should end a sentence with a preposition (*hint* you sometimes can). This little spread takes me back to my “School House Rock” days. These are “hotties” that make your writing pop off the page, like a push-up bra for sentences. A few words to get you started: cashmere, nuance, and enrapture. These are “notties” that make the piece you’re working on say, “Wah, wah, wah…” Words, like just, really and very are just, really, very weak. This is not overkill… And since we’re on the subject, neither is six cups of coffee a day! When you understand how the root acro- relates to “height” in acrobat and acronym (being derived from the high capital letters), it unlocks new layers of the language you might not have considered. You’ll feel like you’re reading the Matrix. I know all the words. Ha! Not really, but wouldn’t that be something? I keep a running list of words I’ve just learned, working them into my vocabulary through repetition and practice (the spread below is a continuation of a much longer list). You’re probably a master of they’re, their, there, your and you’re, but what about affect vs. effect or stationary and stationery? I write every single day, and I still screw up new things to put on my list. You can’t be a walking thesaurus, but you can broaden your vocabulary for your frequent topics. I use no less than six words that mean chocolate. Hey, it comes up a lot! 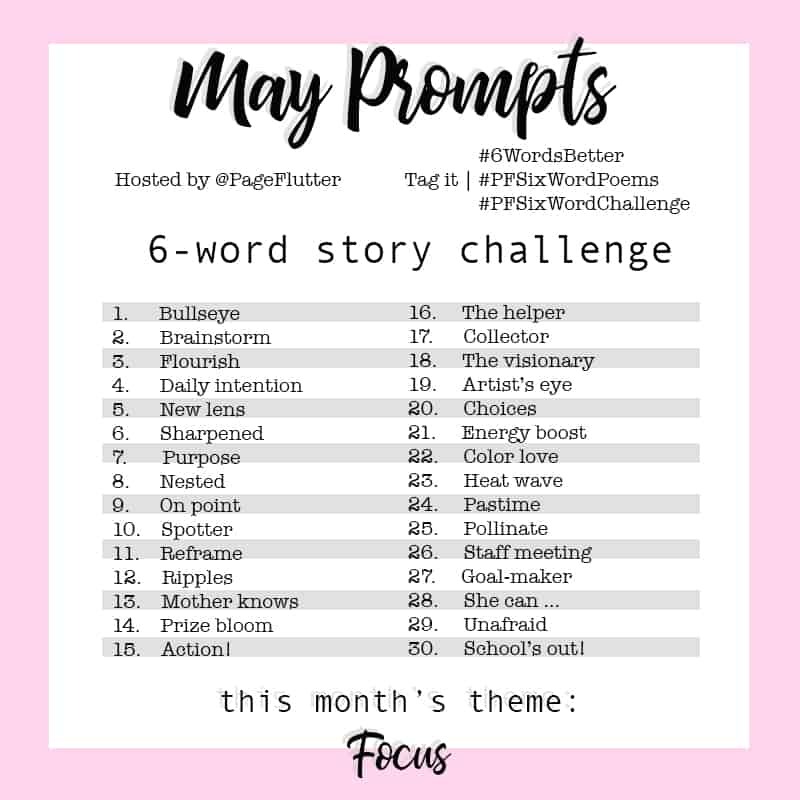 I was blown away by the positive response to my 6-word story post on Instagram. It’s further proof that people who don’t consider themselves writers still connect with the art of storytelling. Everyone has time for six words, and it teaches brevity. “There is nothing to writing. All you do is sit down at a typewriter and bleed.” ~ Ernest Hemingway. Make note of the parallels in your everyday life: How the woman in the market had a voice that slipped from her lips like ribbons of buttery caramel, or the way a person holding a secret suddenly cinches up like a drawstring purse, afraid it might escape of its own accord. Write it down! It will make you a better observer, storyteller, and writer. You already notice things as subtle as the sound of popcorn falling on a tile floor, and the smell of morning rain. When you render such details in your writing, everything in the story becomes suddenly true. Don’t be surprised if your new appreciation of these tiny joys makes them pop up on your gratitude list. 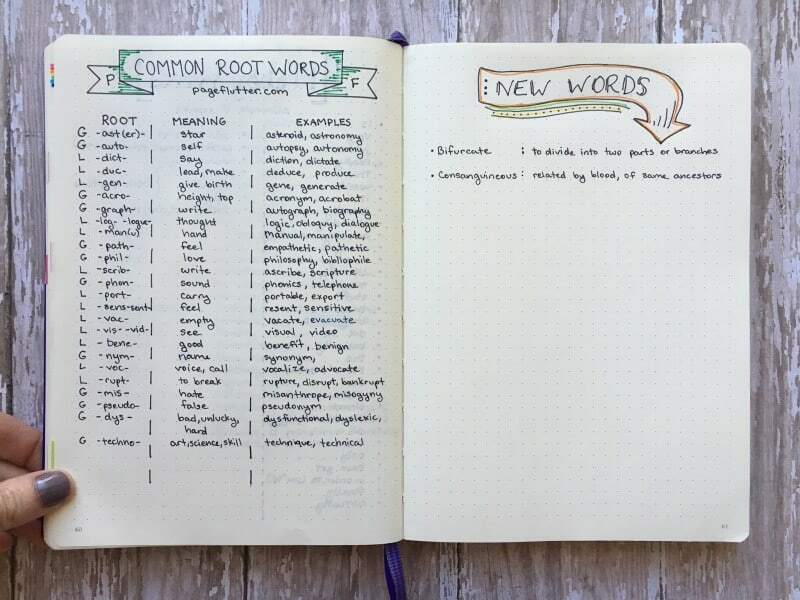 Whether you’re a blogger, executive, or novice who writes in the privacy of your journal, you’ll enjoy breathing new life into the words you put on paper. I want to hear from you! How do writing skills relate to your everyday goals? What tools do you use to improve your writing? What a great list of ideas! 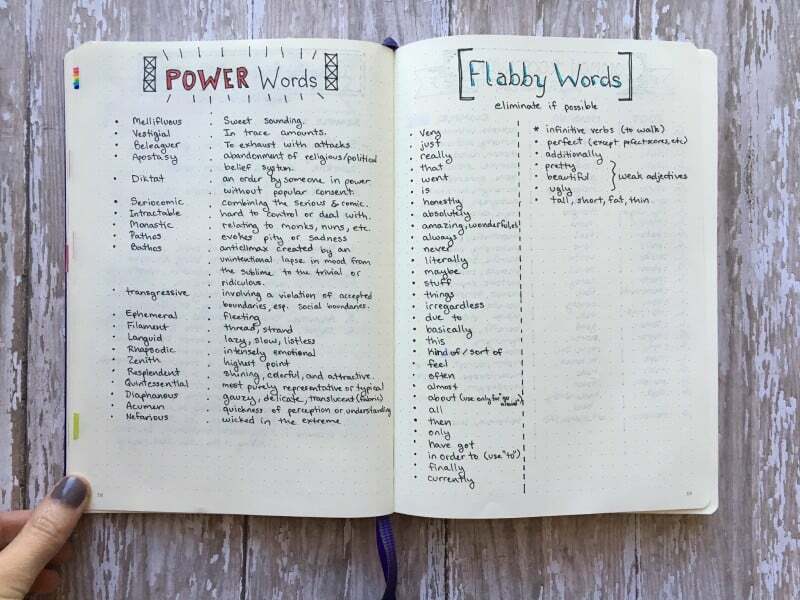 Not only did I add a page with this list to my own BuJo, but I’m brainstorming ways to use these ideas in notebooks with my middle school writers in the fall. Thanks for the inspiration!! I can’t tell you how happy I am to hear that, Heather! Writing enriches my life greatly, and I wish someone had helped me develop the skills at a younger age. Please let me know how it goes with your class! I’ve been trying to get back into writing again. I ordered the two books you recommended and added many of the pages as well. Thanks for the inspiration! Seriously, I love these ideas! But I feel like a bit of a copy cat if I put the same exact things in my journal, lol. Thanks for this post! 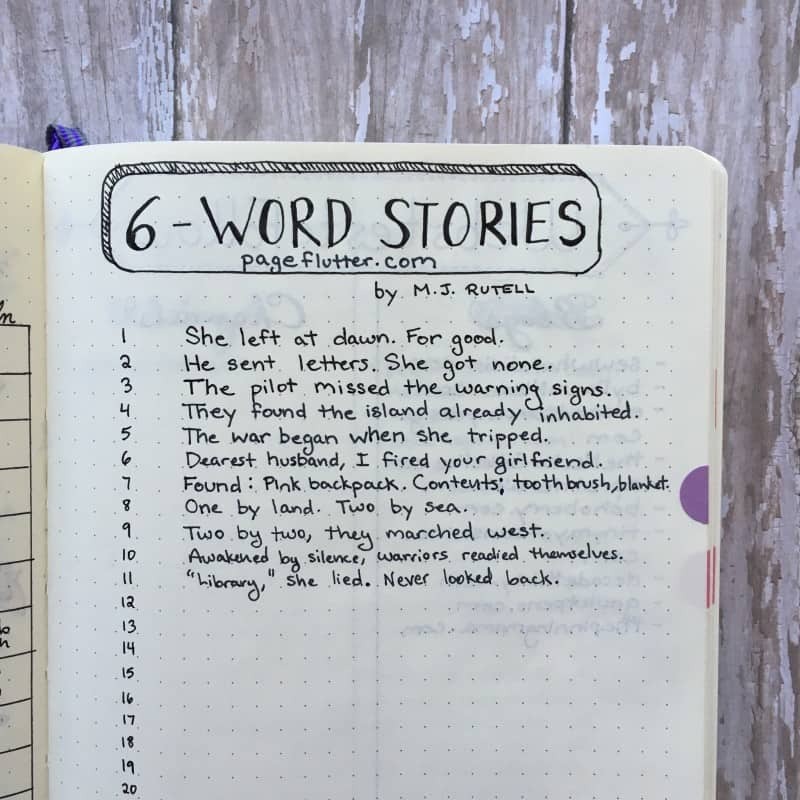 I am a poet, and I was curious to know how I could use a BUJO for my writing. I am inspired! I’m glad to hear it! Keeping notes aides writers of any kind. This is the only method I’ve ever been able to use in a consistent & organized way.